Overview: Imagine if you were a leader of a team of super-heroes, and you need to add new members. How do you do that? Check online reviews, or get recommendations from the current team. What if you were a non-team, with no official rules or charter or even a leader. In that case, you air a television commercial inviting would be members out to the Long Island home of one of your members, a member who is trying to keep his identity a secret. This is what makes the Defenders such a quirky book! As I mentioned above, the “Defenders for a Day” story kicks off this volume. Dollar Bill, a sidekick of sorts to the team, puts out a TV commercial inviting hero try-outs at the estate of Kyle (Nighthawk) Richmond. Who should show up is a B-List of Marvel heroes from the late 1970s – Ms. Marvel, Iron Fist, Hercules, Nova, Jack of Hearts, Marvel Boy, the Falcon, Captain Marvel, Havok, Black Goliath, and many, many more. Anyone who has read comics for any period of time can anticipate what happens next. Various heroes all vying for a spot on the team, a misunderstanding, and the next thing you know everyone is fighting. The story gets even better, when Iron Man shows up to share the news that a lot of villains are running rampant in New York City, claiming to be a member of the Defenders. Everyone finds a way to get back to the city and get things straightened out. Net result of all of this “Defenders for a Day”? No new members. One highlight I found in this book was the development of the characters. We dive into the back stories for Valkryie, Nighthawk, and in particular Hellcat. Be honest, who remembers Patsy Walker being friends with Millie the Model? It is during the late run of the book that the team “changes” headquarters and sets up shop at Patsy’s house. What makes this Essential? : Writing a review for the Defenders keeps getting harder and harder. It’s not a traditional book where there seems to be a reason for these characters to be together. If you like one of these characters, or can appreciate the humor in this quirky book, then please give this a read. But my gut feeling tells me that even if I was to loan this book to someone to read, I would feel very guilty about wasting their time reading these issues. If you like this volume, try: the I Am An Avenger trade paperbacks from 2010. Yes, this is a review of the Defenders and not the Avengers, but the Defenders have not been collected as often. Maybe if the Defenders were a “real” team… but I digress. These two trade paperbacks collect many of the Avengers issues where new members were asked to join the team. Specifically, in the first collection, Avengers #221 is reprinted, which is one of the first issues of Avengers that I bought off of the spinner rack. 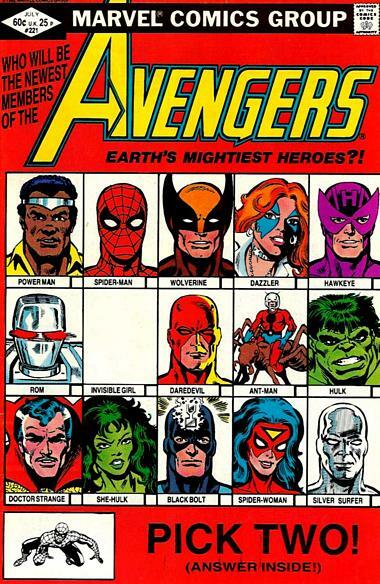 In that issue, the Avengers roster is down to just four members: Captain America, Iron Man, Thor, and the Wasp. They each go out to seek out new recruits to join the team. Numerous heroes are asked, and most politely decline. Spider-Man turns them down, but then has second thoughts when he finds out that active members on the team receive a weekly stipend. In the end, the Avengers add Hawkeye and She-Hulk to their active roster. The cover to this issue stood out, as it featured a mug-shot line-up of the various potential recruits featured in the story. This is definitely a step-up from the “Defender for a Day” story that started this collection. With any team book – Defenders, Avengers, X-Men, Justice League, etc. – the books thrive on the rotating line-ups, and the “Old Order Changeth!” issues are some of the most memorable moments. Overview: Full disclosure people – this may be a short review! When dealing with a non-team of heroes, with no official headquarters or leader or matching uniforms, what is there to talk about? But that is what makes the Defenders the most unique collection of heroes in comic books. So here we go with Essential Defenders Vol. 3. Let’s start with the line-up. Doctor Strange, the Hulk, Valkyrie, and Nighthawk remain the core of the team. But some new faces stop by for their time with the un-team. The female version of the Soviet hero Red Guardian “joins” the team in issue #35. Hellcat wanders over from Avengers Mansion in Defenders #44, and would become a constant with the team for the next 80+ issues. The Devil-Slayer stops by for the final story-arc in this volume, but he will not be seen again until Essential Defenders Vol. 5. Finally, Clea could be considered a “member” of the team, but she always feels like Doctor Strange’s sidekick who is along for the ride just because of Stephen. What makes this Essential? : Wow, where to start…… Hmmm, being quite honest, I found this a very forgettable volume. I know I read this at some point, but I am struggling to recall much of what happened in this collection. This should be a more important book, with the end of the brilliant Steve Gerber’s run on the title, and the start of the creative run by David Kraft. But I just can’t give this a thumb’s up. If you are a fan of the quirky stories of the mid-1970s, then track down a copy of this volume. But I don’t think you would be missing out on much if this is not part of your personal library. If you like this volume, try: the second volume of The Order from Matt Fraction and Barry Kitson. Following the events of Civil War, Tony Stark was named director of S.H.I.E.L.D. One of his roll-outs to make things safer for all Americans was the 50-State Initiative, which was a plan to place a team of super-heroes in all states. For California, the team was named the Order. (Side note, the series was originally solicited as The Champions, until it was determined that Marvel did not own the trademark for The Champions any longer. Oops!) The Order was made up of 10 heroes which all loosely resembled the Greek pantheon of gods. Each character had their own feature over the 10 issues of the series, which ended when Matt Fraction felt the story had been told. This has been collected in two trade paperbacks, but I’m sure the individual issues can still be found in the back issue bins. It’s worth a read for the Kitson art and the Fraction story. 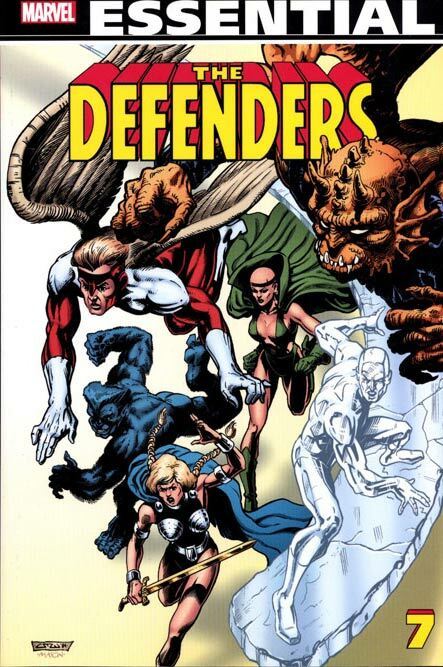 As to why I make this recommendation, I started to recommend the 2001 Defenders/Order series, but recalled that I already put it out there win my review of Essential Defenders Vol. 1. Personally, I think this Fraction/Kitson version of The Order is more interesting, so give it a look! Overview: Welcome back to the ongoing adventures of Marvel’s non-team of heroes, the Defenders! The team with no rules, no charter, no membership cards, and no matching uniforms. 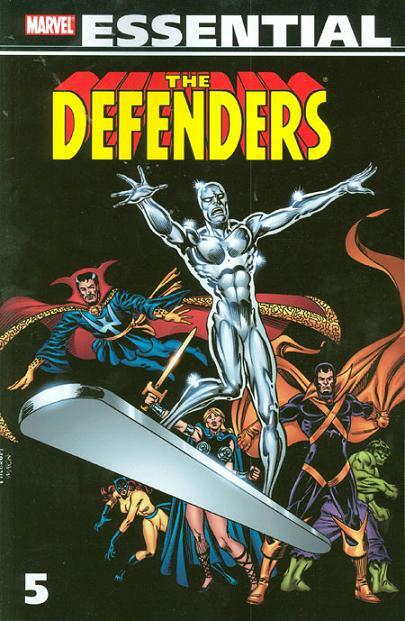 Core founding members Sub-Mariner and the Silver Surfer have moved on in this volume to other adventures, but will return in later Essential Defenders volumes. In their place, Valkyrie and Nighthawk team up with Doctor Strange and the Hulk to form the core members of the team in this volume. 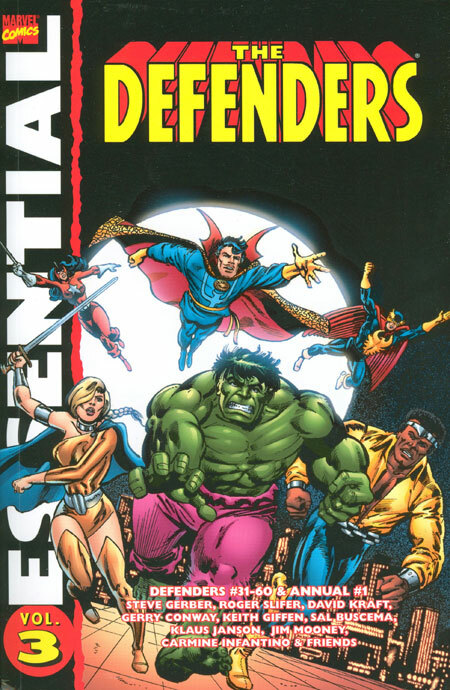 Other heroes hang out with the Defenders for a few issues in this volume, such as Power Man, Son of Satan, the Thing, and Yellowjacket. Two story arcs in particular stand out in this issue. For issues #15 and #16, the Defenders face off against Magneto and his Brotherhood of Evil Mutants, a group of characters that had not been seen much with the X-Men title on hiatus. This is followed up in #17 and #18 with the debut of Wrecking Crew – three super-powered construction working villains that work with the Wrecker. The Wrecking Crew have been mainstays in the Marvel Universe since then, fighting everyone from the Avengers to Spider-Man to Wolverine, among others. The volume concludes with a long story arc featuring the return of the Guardians of the Galaxy. The Guardians made their debut in the late 1960s, but were unused for many years until Steve Gerber brought them back to the forefront in Marvel Two-in-One #5, The story arc in Defenders introduced Starhawk to the team. What makes this Essential? : While there are still moments where the title feels like an extension of the Doctor Strange book, the Defenders start to come into their own as an individual title, albeit an unofficial team. Steve Gerber begins his long run with the team, and we start to see Gerber’s familiar story-telling techniques which will be more prominently seen in the pages of Howard the Duck. This is an interesting read, but I just don’t know if it’s essential to read. Footnotes: Marvel Two-in-One #6 and #7 are also reprinted in Essential Marvel Two-in-One Vol. 1. Marvel Team-Up #33-#35 are also reprinted in Essential Marvel Team-Up Vol. 2. Marvel Treasury Edition #12 is also reprinted in Essential Howard the Duck Vol. 1. If you like this volume, try: the Guardians of the Galaxy: Tomorrow’s Avengers trade paperbacks from 2013. We are given a taste of the Guardians of the Galaxy in this Essential Defenders volume. But to find the origins of the original Guardians, check out these collections. Originally created by Arnold Drake and Gene Colan, but fully developed later by Steve Gerber and Al Milgrom, the Guardians come together to help save the 31st Century. Vance Astro, Martinex, Charlie-27, and Yondu form the original core, and we see Starhawk join during the appearance in Defenders. Whether you view this as Marvel’s version of the Legion of Super-Heroes, or as a future version of the Avengers, the Guardians are a fun look at one possible future for the Marvel Universe. Given the success of the summer blockbuster of the same name (but different character line-up), fans should check out these volumes to see the roots of the original Guardians of the Galaxy. Overview: Doctor Strange! The Hulk! The Sub-Mariner! More than men, these beings border on being forces of nature. Brought together against their wishes, these heroes unite as one to form the first non-team in comics history, the Defenders! A loose story line drifted across the three titles of the featured characters, all written by Roy Thomas, over a two year period before the trio of characters came together under the Defenders banner in Marvel Feature #1. Following three appearances in Marvel Feature, the Defenders graduated to their bi-monthly title. What made the team unique is that they didn’t necessarily consider themselves as an organized team. The Defenders did not have an organized charter and rules like the Avengers. They did not have matching uniforms like the Fantastic Four. Rather, they happened to be characters who hung out at Doctor Strange’s home and were pulled together at different times to fight foes (mainly magical characters) that threatened the Earth. The Silver Surfer joined the “team” in issue #2 and is now considered to be one of the core members of the team. Longtime members Valkyrie and Nighthawk soon appear, and the regular cast of characters is set for the next few years. The highlight of this volume is the Avengers/Defenders War, which ran for four months across both titles. This was one of the first major crossovers between two Marvel titles that last more than two or three issues. Hawkeye was hanging out with the Defenders at this time, so it made for a lot of interesting match-ups between the two teams (Captain America vs. Sub-Mariner, Swordsman vs. Valkyrie, Iron Man vs. Hawkeye, Vision & Scarlet Witch vs. Silver Surfer, etc.). The format for this storyline became the template for future crossover events for years to come. What makes this Essential? 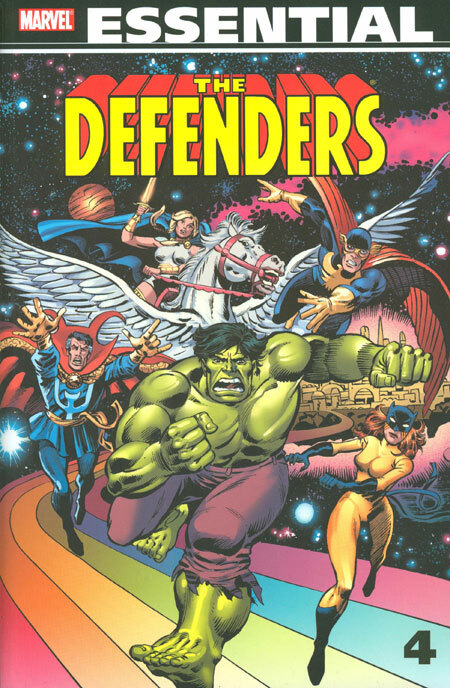 : For a team that was not officially a team, the Defenders have a long history in the Marvel Universe. Primarily composed of characters best described as “anti-social” or “loners”, the members fought each other as much as they did their foes. There are a lot of times where this title feels more like an extension of the Doctor Strange book, as his villains are the team’s primary foes. I think if you are a fan of the team or the main characters (especially Doctor Strange) then give this volume a read. If you are coming to this for the Avengers/Defenders crossover, then pick up Essential Avengers Vol. 5 or the Avengers/Defenders War collection. Footnotes: Doctor Strange #183, The Sub-Mariner #22, The Incredible Hulk #126, and Marvel Feature #1 are also reprinted in Essential Doctor Strange Vol. 2. 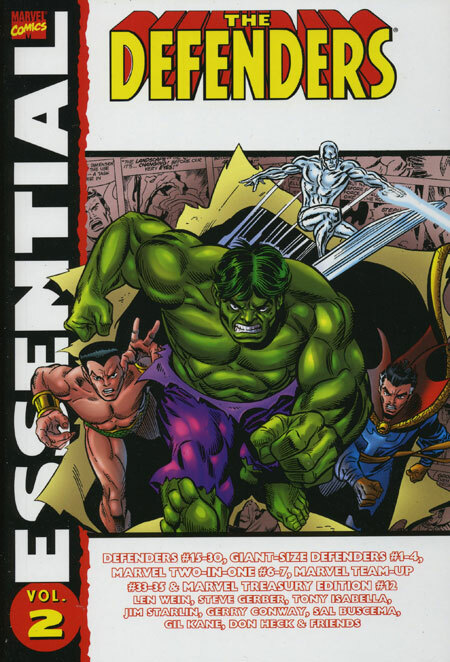 The Incredible Hulk #126 is also reprinted in Essential Hulk Vol. 3. 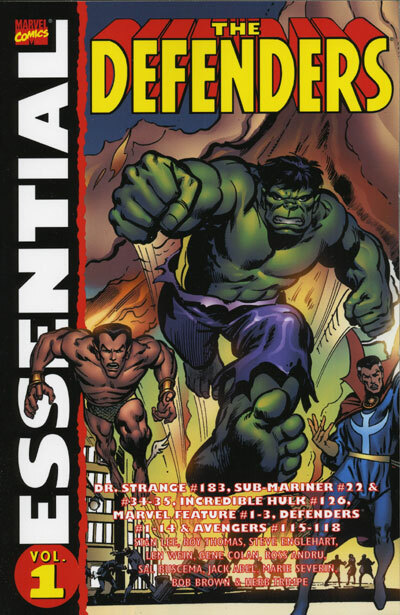 The Avengers #115-#118 and The Defenders #8-#11 are also reprinted in Essential Avengers Vol. 5. Tom Hagen and the Rutland, Vermont, Halloween parade make an appearance in Marvel Feature #2. For more information on Tom Fagan, see Essential Avengers Vol. 4. 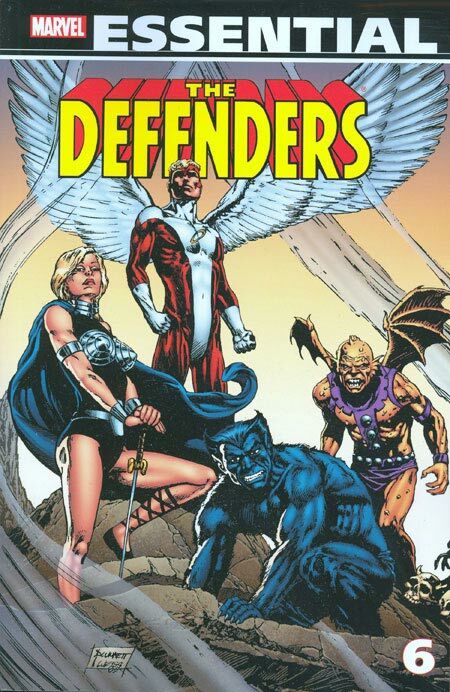 If you like this volume, try: the Defenders series from 2001. Created by Kurt Busiek and Eric Larsen, this series once again reunited the core members of the team under a spell — Yandroth manipulated a spell so that Doctor Strange, the Hulk, the Sub-Mariner, and the Silver Surfer must reunite any time the world is in danger. This volume ran for 12 issues when it was then renamed The Order, which ran for six issues. These were numbered #1-#6, but they also continued the numbering from The Defenders with #13-#18. This story mixed a lot of humor into the action. Sadly, this volume has not been collected into any trade collections so you may need to dive into the back-issue bins to track this down. For a look at the 2008 series The Order, please take a look at Essential Defenders Vol. 3.